Learn how to use PayWhirl to save customer cards for future use, how to process recurring payments and generate orders on BigCommerce. If you are a BigCommerce customer there are many benefits of integrating with PayWhirl including: recurring payments & billing, stored customer credit cards, layaway plans, pre-orders, custom invoicing, subscriptions, membership content and many other uses cases. BigCommerce doesn't support subscriptions or stored credit cards in their native cart or checkout process but you can use PayWhirl to add this functionality to your online store. When a customer completes a purchase through a PayWhirl widget, their address and credit card info will be stored in the gateway you connect so both the customer and/or you, the admin, can use it again if needed. Customer's can also return and login to their "customer portal" to manage their information, cards on file, etc. (this can be disabled if you want). The customer portal is typically embedded directly into the existing BigCommerce "My Account" section of your website so customers are unaware there are two different systems. Or you can use the hosted version of your customer portal, if you don't want to integrate the two systems. Either way, customers can also use the same login credentials on both PayWhirl and BigCommerce. Once customers login, they have a place to purchase subscriptions and they can purchase additional products in PayWhirl with their saved info, all without ever leaving your website. 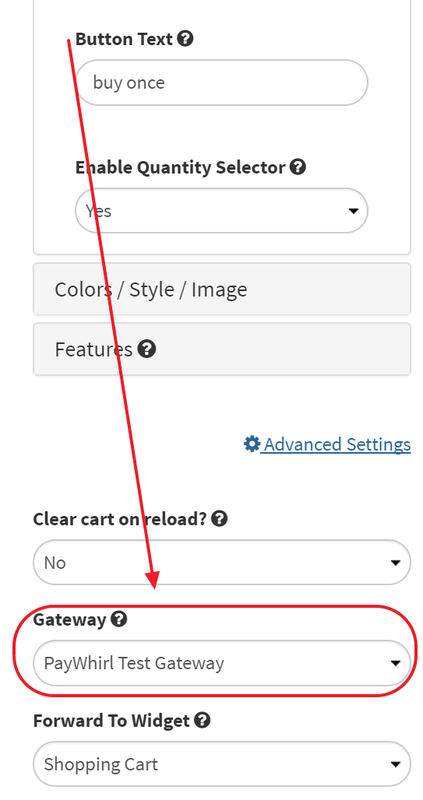 If you already have products in BigCommerce you can continue using the existing cart checkout. 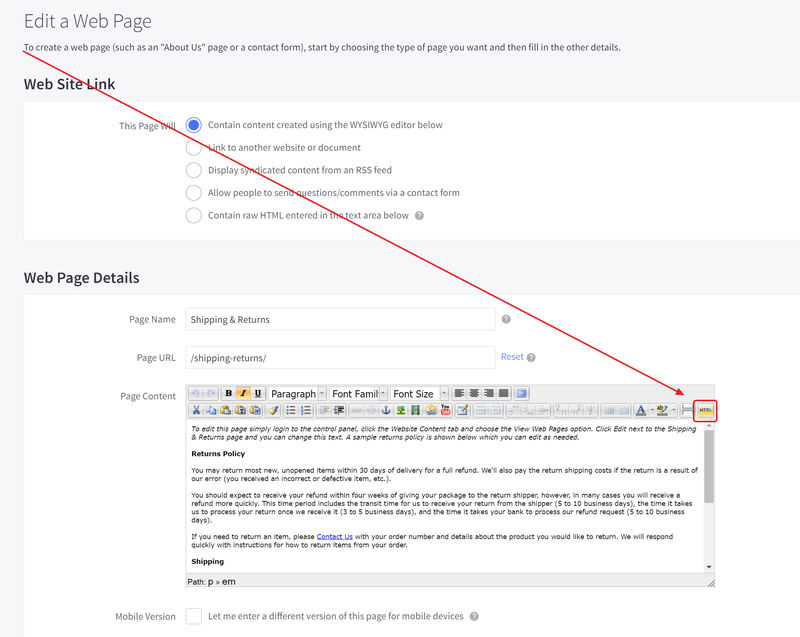 Embed your widget(s) into BigCommerce page(s) by copying / pasting embed codes into your pages / product pages. Connect and Activate Live Payment Gateway. Note: By default every widget is connected to the Test Gateway and doesn't store or charge credit cards. To begin accepting live payments make sure to connect a gateway to each widget that is embedded in your site. Also make sure to change the customer portal settings page. Install the app - Once you have the PayWhirl App installed you can now create payment plans for use with BigCommerce. You will see new options on the plan settings page to help you control how orders flow into BigCommerce after successful payments. Orders are be generated based on your plan settings. Note: You will need to create a plan or upsell for every product/service you want to sell through PayWhirl. Setup payment widget(s) and/or payment forms - After you have connected PayWhirl to your BigCommerce store and created your payment plan(s) you will need to create payment widgets or forms so your customers can checkout securely on your site. When you setup your payment widgets) you will choose which plans to display in each widget. After you save your widget(s) you will receive an embed code (a few lines of code) that you can then to copy / paste into BigCommerce. Create page(s) / product page(s) in BigCommerce for your widgets - Once you have your embed codes for your widgets or buy buttons you can proceed with pasting the code into the HTML of any page or product page within BigCommerce. 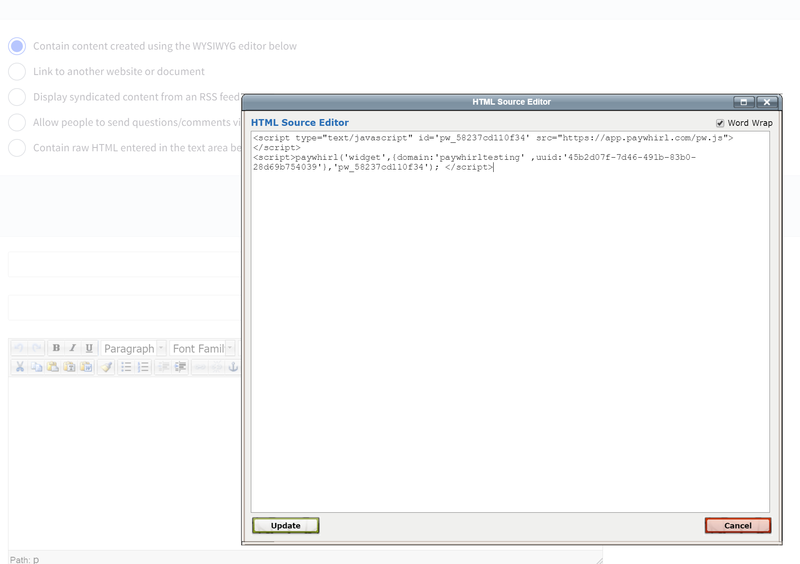 Use the HTML input method on the WYZIWYG editor by clicking the icon that says HTML in the graphical page editor. 4. When you are ready to go live, edit the widget and select the live gateway. Each widget type is a bit different, but towards the bottom you can click on the advanced settings. Select the live gateway from the drop down. If you haven't connected a gateway, checkout one of these guides. Stripe is available on all plans, while Braintree and Authorize.net are available on our monthly paid plans). Each businesses setup is unique but typically BigCommerce customers will setup ONE PAGE in BigCommerce and ONE WIDGET for EACH PRODUCT they want to offer a payment plans on... Then, they will setup however many PLANS they want to offer for each product and build a WIDGET that has all of the PLANS for the specific product. Finally, they will embed the WIDGET into the PAGE they created originally in BigCommerce.